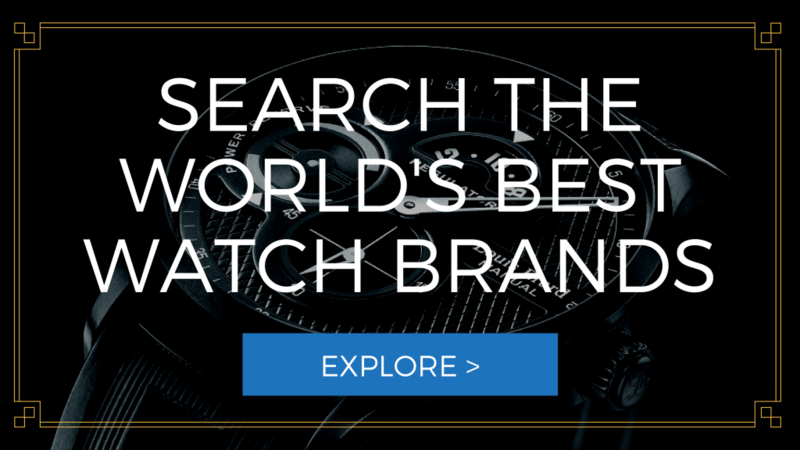 Nixon doesn’t have the storied history of a lot of watch manufacturers. In fact, they’ve only been around for 19 years. But that doesn’t mean you should write them off. Nixon has branded itself as the premium watch brand for the youth lifestyle market and their focus on youth has paid huge dividends. Nixon offers quality watches, with unique designs and as we’ve noted in 3 Nixon’s You Should Buy Right Now and our recent review of 5 Nixon pieces, they’re affordable. Our guide to the Best Nixon Watches According to Price will showcase the unique aspects of this brand no matter what your price point. Go light, yet fashionable in this all-gray piece. 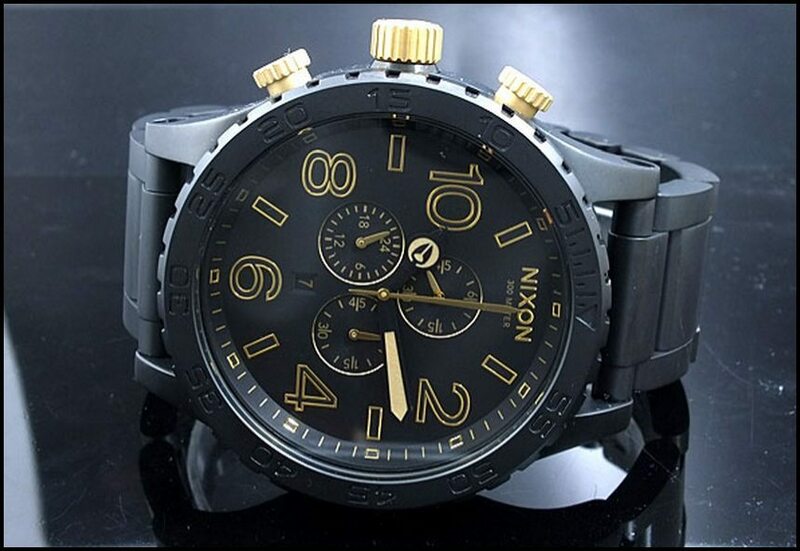 This watch features a gray stainless steel case with a matte gray dial embellished with black stick hour markers with a pop of yellow on the its hands. The dial is embraced by a fixed gray polycarbonate dial. The straightforward look of the dial is matched with a matte gray rubber band. For days you feel like going with an easy, clean, and purely tells time piece, then this one is for you. And since it is lightweight, it feels comfortable to the wrist especially in long-day use while performing strenuous activities. For a more refined look, go for this Unit White watch that is constructed with custom injection molded polycarbonate case and fixed polycarbonate bezel highlighting the beauty of the positive or negative LCD display made even more versatile with its backlight function. This piece, completed with a silicone band, is a functional piece through its 12 or 24-hour time display, dual time feature, temperature gauge, chronograph, countdown timer, and alarm. This watch tells us that yes, you can go clean even with multitude features. Nixon’s Corporal SS collection is a precious one. Among the remarkable piece under this collection is A3461235. Starting off with its stainless steel case, this piece exhibits a gray dial adorned with solid-tone Arabic numeral and stick hour markers. Both the minute markers and hands come in bright orange, thereby improving the contrast and readability of the same. This piece is designed with raised bezel and three-link bracelet. It is powered by Japanese quartz and has a water resistance of 100 meters or 330 feet. Surprise other people with this unique and distinct Newton watch. Powered by Miyota Japanese Quartz, this watch features a polycarbonate case with an interesting dial. The dial comes with custom hour disc and minute disc that tell time in the most unique way. It is likewise protected by a scratch resistant mineral crystal. The case connects to a silicone band. It is a water-resistant up to 99 feet or 30 meters. Another first for Nixon is this Axis watch that features a horizontal chronograph movement across its unique rectangle-shaped black dial. The clean black dial is embellished with two hands to tell time. The chronograph feature supports the second, minute, and hour functions. It is protected by a hardened mineral crystal. The solid stainless steel case and band looks absolutely strong and elegant. It goes well with any outfit. You can never go underdressed with this sophisticated and polished piece. The solid stainless steel case comes with a textured shiny sunray silver-tone dial embellished with silver index hour markers and hands. The dial just proves how functional this watch can be as it supports date window, 60-minute, 60-second, and 24-hour subdials. Beautifully tapered on the case is the brown leather strap. This piece is a masterpiece when it comes to combination of style and functionality. Another gorgeous piece from Corporal SS collection is this all-black gem. This is an elegant and fashionable way to upgrade your style. It comes with a black stainless steel case and three-link stainless steel bracelet. The dial is very sleek with its minimalist and clean design as exhibited by its Arabic numeric and stick hour markers and glittery hands. Powered by Quartz movement, you will never go late to highly important events and gatherings. 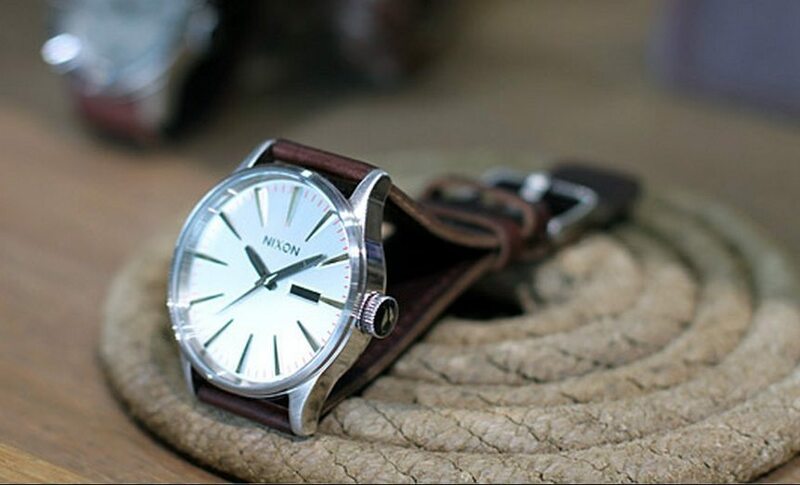 Nixon never runs out of eye-catching pieces that will look great in your own collection. For gunmetal watch lovers, you will fall in love with this graceful and modish A3561. It comes with a stainless steel case showcasing the beauty of pink minute markers, silver-tone skeleton hands and hour markers. This watch is equipped with durable three-link stainless steel bracelet that elegantly wraps around the wrist. Moreover, it has a day and date window for added functionality. Apart from the glitzy and shiny watches, Nixon also has a wide selection for rugged yet stylish pieces like this A3151. This watch is a six-hand Japanese quartz watch with its triple chronograph function. It is also equipped with a date window at the four o’clock position of the dial. The hands are luminous to aid timekeeping under low light situations. The ruggedness of the watch is balanced with the sophistication that a black leather strap brings to the entirety of the watch. Furthermore, it is a water resistant up to 100 meters. If you are a fan of clean and masculine-looking watches, then you will love this piece. Dressed in gunmetal, the stainless steel case features a black dial ornamented with gunmetal or grey hour markers with a pop of orange on the 12 o’clock position. The skeleton silver-tone hour and minute hands as well as the orange second hand improves readability of the same. This watch is a water-resistant up to 100 meters. When you are looking for a reliable pice that is a victor both in style and functionality, then you are on the right page. This A198-1061 is a good looking watch you can use day and night. It is crafted with a matte black stainless steel case that holds the matte black dial, which is embellished with torquise baton hour markers and luminous black hands. It is likewise equipped with a date window at the nine o’clock position of the dial. Everything is protected with a mineral crystal to ensure its flawless beauty and functionality. As for the band, it has a three-link matte black bracelet for versatiity. If you are a true adventurer and loves spontaneity, this is the perfect piece for you. This 48-20 Chrono watch is constructed with a solid stainless steel case that is ready to take on any challenge. The dial is designed with a concave dial ring showcasing the bold Arabic numeral and index hour markers and molded hands with flashes of yellow on the second hand and 12 o’clock hour marker. Everything you see on the dial is protected by a hardened mineral crystal for heavy duty timekeeping. It is also built with a unidirectional bezel with countdown timer. The stainless steel three-link bracelet complements the case of the watch. For functionality, this watch is designed with triple subdials and date window. Perfect for some beaching, this piece comes with 200 meters water resistance. Turn heads with this majestic watch you will love having around your wrist. With this Rotolog watch, you are taking fashion on to another level. And yes, this high-fashion piece is actually made of stainless steel case with real wood or enamel inlay. The dial looks sleek and modern with rotating discs with printed hour markers and LED light for low-light or night use. The bracelet is a two-link system of stainless steel with real wood or enamel inlay. For the right fit and safe closure, it uses stainless butterfly clasp. I will not be surprise if you will receive lots of questions and compliments about your watch. With its elegant design and unparalleled functionality, this gold-tone watch is a must-have. Dressed in gold, this luxurious piece features a brushed stainless steel case designed with gold-tone dial and large Arabic and indices hour markers luminous decorative hands. The bezel, which likewise shimmers in gold, rotates in a unidirectional manner with countdown timer feature. The case is connected to an equally lavish gold-tone stainless steel bracelet. For superior functionality, this watch comes with date window triple subdials powered by Japanese quartz movement. Whether it is something for investment, collection, or simply a reward for your hard work, you have to check this next piece out. To begin with, this powerful watch exhibits the classic beauty of black dial holding the large Arabic numeric and index hour markers and rose gold-tone hands. This is a plus for aging men who needs appropriate play of colors for contrast on the dial. It has a dual chronograph feature and a date window. The bezel rotates in a unidirectional direction that may also serve as a countdown timer. Connected to the attractive case is an equally attractive black stainless steel bracelet. This watch is versatile you can use it from day to night. Loving colors? If yes, you will find a friend in A0371698. This watch is very special and unique. Go out and be bold and fearless sporting this piece that is perfect for the summer season and gives you that summer feel all-year round. Like any other 42-20 Chrono watch, this one is constructed with a solid stainless steel case and bracelet. The case, however, is beautifully distinct in such a way that it is very youthful and sophisticated at the same time. The black dial is embellished with large hour markers and luminous decorative hands. It has date window and three subdials, of which each has a colorful hand for style and readability. The bright green on the watch sweeps around the dial giving life to every movement. You will definitely smile from the beauty of the colorful unidirectional rotating bezel made up of colors blue, green, yellow, and pink. Take on a vintage looking watch in the freshest way possible that is A465-1890. This contemporary take on vintage is what will motivate you to dress up everyday of the week. This piece boasts its custom stainless steel case that holds the patterned dial embellished with rose gold-tone hands and hour markers, and 60-second subdial. All of the aforementioned complement the polished rose gold-tone bezel. Tapered to the case is the urbane and tasteful brown leather, which wraps comfortably around the wrist. Look good and feel good with this sophisticated watch you will love wearing all day. Powered by Quartz for excellent precision, this is also a water-resistant up to 100 meters. This list will never be complete without this dashing piece perfect for the gentlemen. 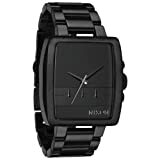 Minimalist in style, this piece is constructed from stainless steel case and three-link stainless steel bracelet in black. The solid case features an attractive and clean black dial embellished with rose gold-tone index hour markers and hands for the classic feel. It has a date counter at the nine o’clock position of the dial made special with a date magnifier crystal, which sits adjacent to an oversized crown. This is a straightforward piece that is overflowing with elegance and style.